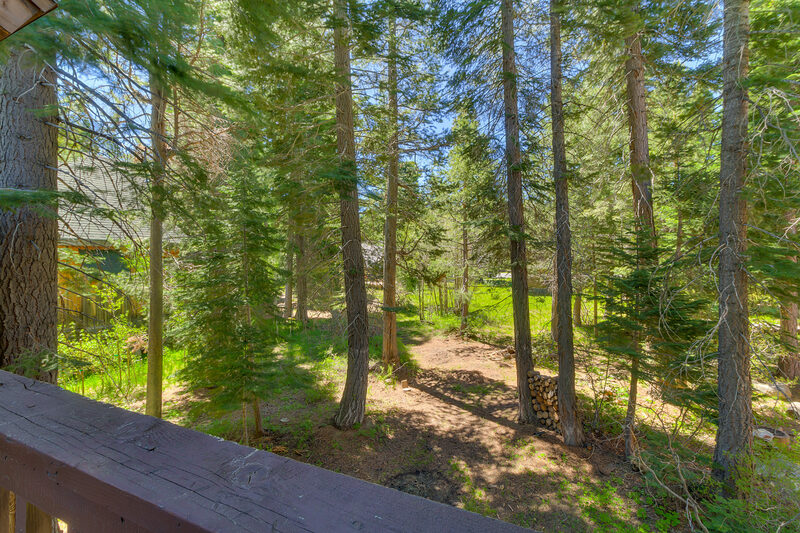 Don’t miss this clean and comfortable Tahoe-style home with three bedrooms and two bathrooms. With room for up to eight guests, it’s a great value! Knobcone’s vaulted, knotty pine ceilings, abundant natural light, and charming wood bedroom furniture add to its appeal. Gather everyone in the second floor open living room with two sofas, a loveseat, and a comfy chair. Warm up next to the wood-burning fireplace with river rock hearth. Keep everyone entertained with a large flat panel TV with DVD player, plenty of games, and Wi-Fi. The great room extends into the fully equipped, spacious kitchen with stainless-steel appliances. Hearty breakfasts and family dinners are easy in this space where the dishwasher makes clean up a breeze. The large dining table has seating for six. Off the dining area is a huge deck with a propane barbeque and forest views. Downstairs you’ll find the bedrooms and bathrooms. Knobcone has a room with queen bed and en-suite full bathroom with tub/shower. The hall bathroom has a shower. There are two more bedrooms, one with a queen-size bed the other with three twins (one single twin bed and a twin bunk set). Note: this home sleeps seven guests—eight guests permitted. Ample bed and bath linens are provided. Parking for up to three vehicles is available in the driveway. Garage is not available. Dogs welcome with approval. Pet fee not included in rate. Contact us for details. The place was clean and well stocked. We so enjoyed the storm up there... even the "roof avalanche" and mixture of sleet, snow and rain were more enjoyable because we had such a nice place to be. It was perfect for us. The house was exactly as described, very clean, comfortable and in a great location! We would definitely stay here again. The only comment we would make was that the bed covers and sheets had a lot of static. We looked for other bed covers/blankets but could not find any (we may have missed where they were placed). Besides that, the stay was perfect. First accommodations has great customer service and are very responsive. All you want in one! Clean, light, open space, easy walk to beach and activities yet tucked away enough to be quiet and serene.